Carson’s kicking – asset or liability? In the 1960s Latics signed a promising goalkeeper called Gerry Barrett from Fareham Town. According to the Lancashire Evening Post (as it was called then) the young man was renowned in the Hampshire League for his prodigious kicking of a football. His reputation proved to be justified. Springfield Park had a big pitch but Barrett’s punts would regularly threaten the opposition penalty area. It was an attacking weapon that Latics used to effect. Sadly Barrett’s other goalkeeping skills did not match up to his kicking. He was unable to firmly establish himself at the club and his career did not take off as was hoped. Decades later Latics have another ‘keeper who is a powerful kicker of a football. 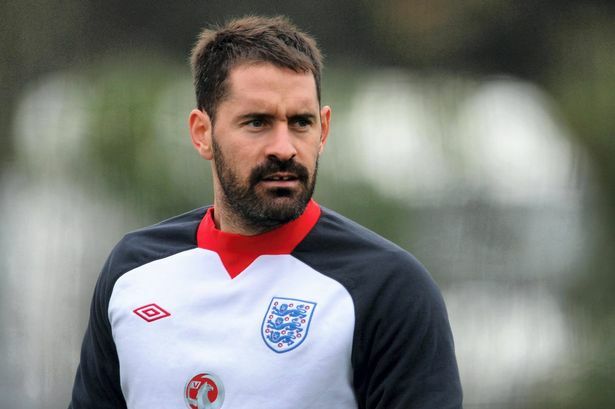 The 29 year old Scott Carson is a highly experienced and capable goalkeeper, with four England caps under his belt. As a teenager brought up in Whitehaven, Carson was a promising rugby league player, but chose to follow career in football. A Leeds United scout saw him playing for Workington in the FA Youth Cup and Carson was recruited to the Leeds academy. Although only 18 years old and still not having made his debut for the first team, Carson was called into the England under-21 squad. After a couple of years at Leeds he was transferred to Liverpool for of £750,000. Last year when Latics played at Charlton the big Cumbrian was given a warm round of applause by the home supporters when he came out for the pre-match warm-up. He had been on loan to the London club in 2006-07, putting in a string of fine performances. Sadly on his return to The Valley as he slipped and injured himself in the warm-up, with Lee Nicholls stepping up in his place. Carson never quite managed to establish himself at Liverpool and that loan at Charlton was squeezed between a previous spell at Sheffield Wednesday, followed by another at Aston Villa. However, he made his England debut against Austria in November 2007, with a clean sheet. A week later he made an error in a crucial European Championship match against Croatia, allowing a long shot from Nico Krancjar to bounce in front of him, then parrying it into the net. England lost 3-2 and manager Steve McClaren resigned the next day. In January 2008 he joined West Bromwich Albion for a fee of around £3.3m. During a three and a half year stay at the Hawthorns, Carson made 110 appearances for his club and two more for England. In July 2011 he was transferred to Bursaspor for £2m, who were to finish in 8th place in the Turkish league, conceding only 35 goals in 34 games. The following season Carson made 29 appearances as Bursaspor finished 4th and qualified for the Europa League. With Ali Al-Habsi out with a long term shoulder injury, Owen Coyle signed Carson from Bursaspor for £700,000 in July 2013. Since then Carson has established himself as the first choice goalkeeper, despite competition from Al-Habsi and Lee Nicholls. Few would argue that Carson has not been Wigan’s best player so far this season, even if his form has dipped over the past month like his teammates. Carson’s supporters would say that he is Latics’ number one goalkeeper and one of the best in the Championship division. His outstanding saves have kept them in the game on so many occasions. His critics would say that he should have stopped the goals scored from narrow angles by Max Clayton of Bolton and Troy Deeney of Watford and should have been in better positions to prevent headed goals by Craig Davies for Bolton and Alex Revell of Rotherham. They will also say that he seems clueless on penalty kicks. Like Barrett, so many decades before him, Carson has a very powerful kick. Years ago playing in the Cheshire League Latics would use Barrett’s kicks to attack the opposition defence. It was non-league football and the ball was often in the air. Compared with many of the teams they faced Latics played quite sophisticated football and their supporters would brand the styles of the opposing teams as “big boot” or “kick and rush”. But on the sticky pitches of the time a long ball game was often essential and Barrett’s kicking was a real asset. These days Latics are playing at a much higher level and the pitches they are playing on are far superior. Moreover possession of the ball has become paramount in the upper echelons of English football. Nevertheless the long ball has come back into play following the exit of Roberto Martinez. With Owen Coyle in charge, Carson would regularly spear long balls up front. Even Uwe Rosler, whose preferred football style was opposed to the tactic, allowed or encouraged Carson to do the same. Usually Marc-Antoine Fortune was the target, but James McClean too would be expected to head the ball from the touchline. Fortune is not the best of centre forwards in terms of goalscoring, but he found a place in Rosler’s teams through his ability to make something out of Carson’s long clearances. Sadly Carson’s long balls have become a feature of Malky Mackay’s tactics. So often defenders who have been unable or unwilling to play the ball out of defence have passed the ball back to the big ‘keeper. The end result has been the central defenders of the opposition having a field day. The corpulent centre halves of the Championship are ill at ease with forwards who run at them, but long balls are their bread and butter. Is Mackay encouraging Carson to make those long kicks? Is it part of his footballing philosophy? Having said that he is the third Latics manager for whom the goalkeeper has performed in that way. In the days of Martinez that kind of distribution from a goalkeeper was anathema. His goalkeepers were expected to conserve possession. A short or long throw from the goalkeeper was the norm. Defenders were encouraged to play the ball out of defence, even if on occasions things went awry. The football currently played by Wigan Athletic under Mackay is close to that which was played under Coyle. The difference was that Coyle had flair players like Jean Beausejour, Jordi Gomez and Nick Powell who made the difference. Carson is a fine goalkeeper, but his distribution is dire. Rarely does he make a long throw to find an unmarked teammate. So often he launches the long ball that rarely proves successful in moving the team forward. However, a goalkeeper is dependent on players moving into good positions in order for him to find them accurately with a pass. In a struggling side that is often not the case. Mackay’s sides have not been known for their flowing, attacking football. However, that does not mean to say that he encourages a route one approach. Central strikers like Andy Delort and Oriol Riera have struggled with the service they have received since joining the club. It has consisted mostly of long hooves from either the back four or the goalkeeper. One wonders if they would ever have joined the club if they had known that was going to be the norm. Scott Carson is a quality goalkeeper. However, his distribution of the ball needs to be seriously addressed. So does the low quality distribution he all too often receives from defenders who find it all too easy to pass the ball backwards rather than take the responsibility of building up from the back. Moreover there needs to be more off the ball movement from players willing to accept the burden of possession from a goalkeeper’s pass. Let’s not put the clock back to Gerry Barrett’s day when Latics were a non-league team. There is no excuse for an excessive use of the long ball in high level football in this day and age. Our keeper and our defence are indeed singing from the same sheet. The problem is their all OUT OF F..KING TUNE!!!! !